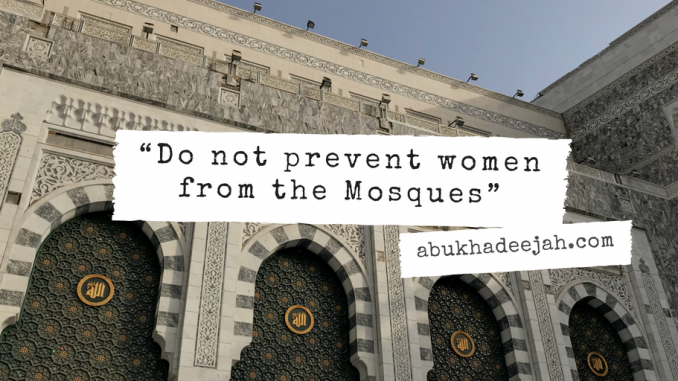 Permitting Women To Attend The Mosque And The Severe Rebuke Of Those Who Prevent Them — Hadīth From Ibn Mājah, Explained By Shaikh Abdul-Muhsin. So, if a woman desires to pray in the mosque, she is not be prevented as the above hadīth proves. She may attain good from attending the mosques, gain benefit in knowledge, listen to admonitions, reminders and guidance. However, permission is granted to attend the masjid so long as there is no fitnah — that she is not put to trial and she is not a trial for others by applying perfume or beautifying herself. So the origin is that she is allowed and not prevented — her guardian should permit her so long as there is no resulting tribulation or harm — and likewise there is no neglect in her responsibilities at home, or in her responsibilities towards her children or other household duties. So, in this narration is a proof to reprimand the one who opposes the Sunnah and to censure him verbally. And this is something reported from the noble Companions (may Allāh be pleased with them). The hadīth states: “Do not prevent the female servants of Allāh from praying in the masjid.” Meaning, if they request that, and in another narration he (salallāhu ‘alaihi wassallam) said: “Do not prevent the female servants of Allah from the mosques of Allah.” (Al-Bukhāri, 900; Muslim 136/442). So in this is an allowance, not that it is recommended for them. So it is not recommended for the woman to go to the masjid — rather it is preferable for her to pray in her home just as it is reported in the Sunnah of Allah’s Messenger (salallāhu ‘alaihi wassallam). So that is better for her — but if she wishes to go and pray in the masjid, then she should not be prevented, and it is allowed for her to leave her home. Muhammad Ibn Yahyā An-Naysabūri: He is Adh-Dhuhli. He is reliable (thiqah) — Al-Bukhāri and the compilers of the Sunan narrate from him. Abdur-Razzāq: He is Ibn Hamām As-San’āni Al-Yamāni. He is reliable (thiqah) — all the compilers of the six books narrate from him. Ma’mar: He is Ibn Rāshid Al-Azdi Al-Basri, then Al-Yamāni. He is reliable (thiqah) — all the compilers of the six books narrate from him. Sālim: He is the son of Abdullāh Ibn ‘Umar Ibn Al-Khattāb. He is one of the seven famous fiqh scholars of Madinah, according to one of the three well-known sayings as to who was the seventh faqīh. All the compilers of the six books narrate from him. Ibn ‘Umar: He is Abdullāh Ibn ‘Umar (may Allāh be pleased with him), one of four well-known Abdullāhs amongst the Sahābah, and one of the seven prolific narrators of the ahādīth of Allah’s Messenger (salallāhu ‘alaihi wassallam). Taken from Sharh Kitāb As-Sunnah min Sunan Al-Imām Ibn Mājah, pp. 104-107, by Shaikh Al-‘Allāmah Abdul-Muhsin Al-Abbād.